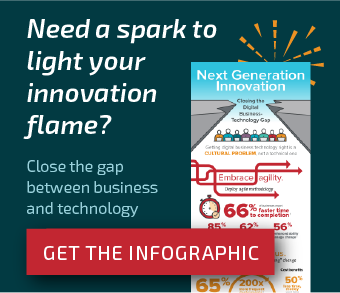 The order of these blog post have been written based upon the complexity required to create that particular type of server health monitoring. 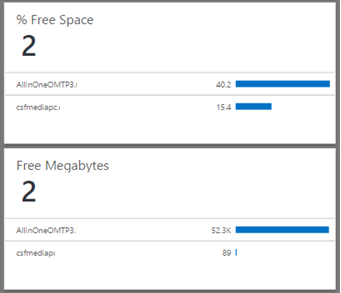 Free disk space monitoring in Operations Manager is relatively complicated (as you will see in the blog post below). For less complicated examples see the Server up/down, and Free memory blog posts referenced above before reviewing this blog post. Warning state occurs when the percentage of free space is less than 10 percent and the actual free space is less than 200MB. Error state occurs when the percentage of free space is less than 5 percent and the actual free space is less than 100MB. Warning state occurs when the percentage of free space is less than 10 percent and the actual free space is less than 2,000MB. In OMS, it is simple to add both of the memory counters. 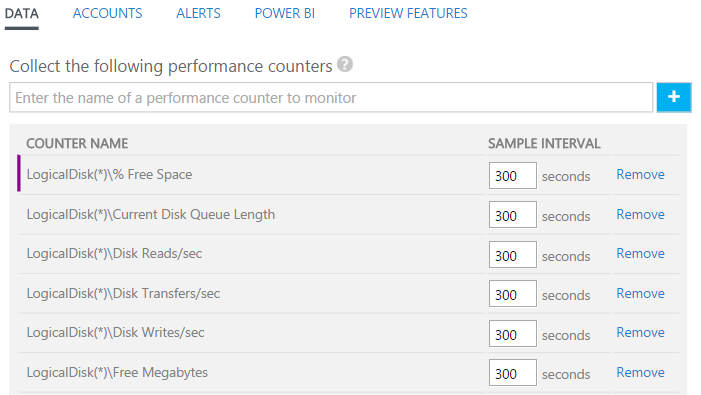 To add these counters we go to the Settings page, on the Data tab and then open the Windows Performance counter section. In this case we need to find a counter which was not already added, so a quick trick is to type the beginning of the name of the performance counter to find what you are looking for. In this case we need LogicalDisk(*)\% Free Space. When a new counter is added it is shown with the purple line on the left as shown below. Once this is saved (top left corner) the purple line will disappear and the change will be committed. 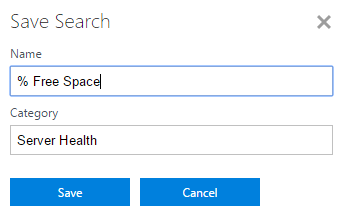 For health based on free disk space we want both: LogicalDisk(*)\% Free Space and LogicalDisk(*)\Free Megabytes. Next we need to develop the queries which we will use for the memory information. 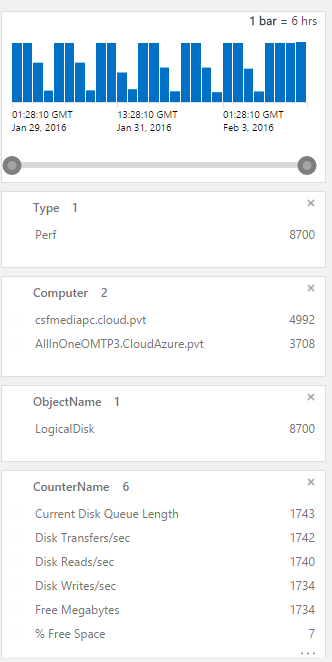 The example below shows both of the relevant metrics for each of the systems which they are being collected for in my labs within this OMS workspace. To create a query which specifies only the two counters we can use the options on the left side (once data has populated so that they appear on the left under the CounterName section). 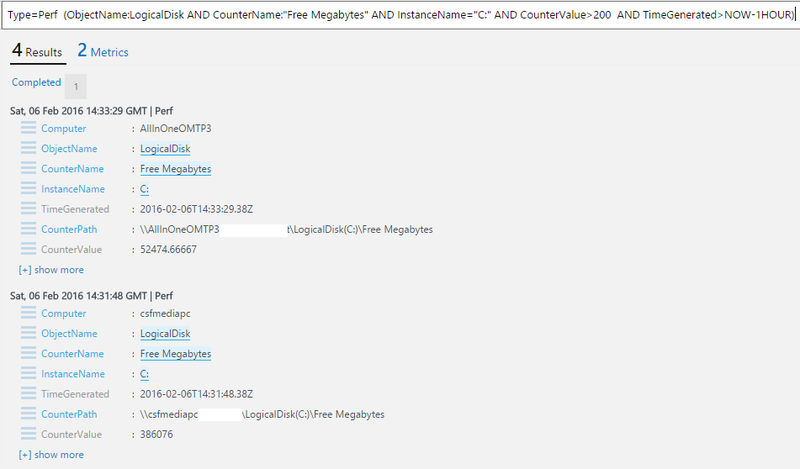 Once we choose metrics we can see the two counters (LogicalDisk(*)\% Free Space and LogicalDisk(*)\Free Megabytes). We can also see that counters from multiple drives are displayed (see the example below showing both the C and E drives). The queries below give the Available Mbytes memory counter information based upon the last 8 minutes of time based on the highest value in the timeframe specified. This unfortunately (currently) does not result in any data being returned. Later in this article we will review the reason behind that situation (see the “Important Note” section of this blog post for details). If we move the timeframe up to 1 hour we see the results that we would expect. 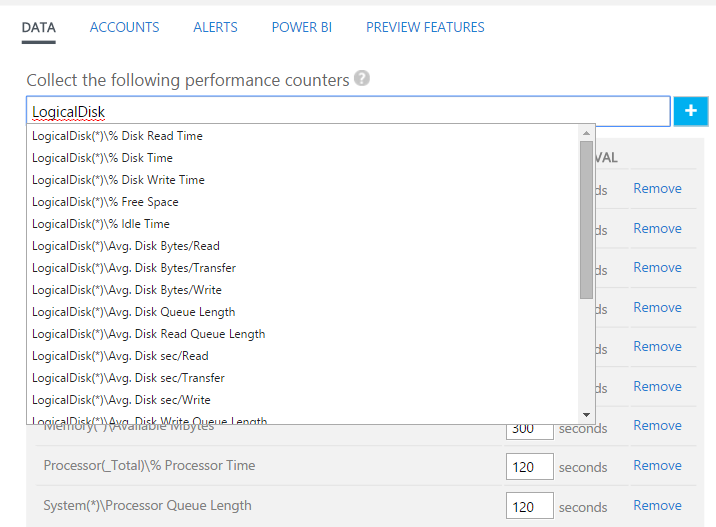 The queries below give the % Committed Bytes in Use memory counter information based upon the last 8 minutes of time based on the lowest value in the timeframe specified. There is one value available based on the query but it does not represent each of the systems in the environment. Later in this article we will review the reason behind that situation (see the “Important Note” section of this blog post for details). Click customize again to save the new dashboard items in place. From there we need to restrict this down to only the C drive. And then we need to specify the value for the counter to be less than 10. To verity this query, we can reverse the query so that instead of checking for a value of < 10 it is now looking for a value of 10. 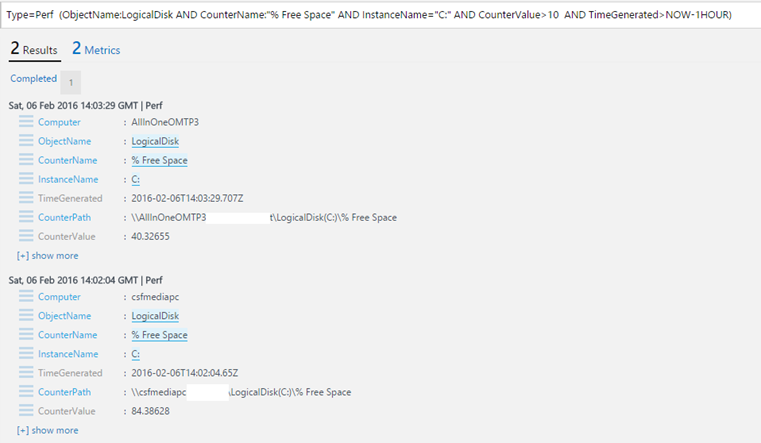 The query for Free MB is just like the one for % Free Space, just updated to reflect the new counter name and new value. We can also combine the two queries resulting in a single one which alerts if either condition occurs. Unfortunately, using an AND condition results in no values. This is logical but unfortunate. It is logical that the counters do not match so therefore the AND condition would never occur. It is unfortunate because this approach is not quite the same as what we do within Operations Manager currently. NOTE: The queries below have been updated so that they do not fire as duplicate conditions such as a low disk space condition where it is below both the warning and error thresholds. A sample email notification is shown below when I ran tests with the condition reversed (IE: there was too much free space not too little). Important note #1: Based upon my test results and my communications with a few of the other CDM focused MVP’s it appears that while we can currently gather data in near real time (NRT), the queries are not able to be used to represent that data. The queries represent the data which is available once it has been indexed which occurs every 30 minutes. 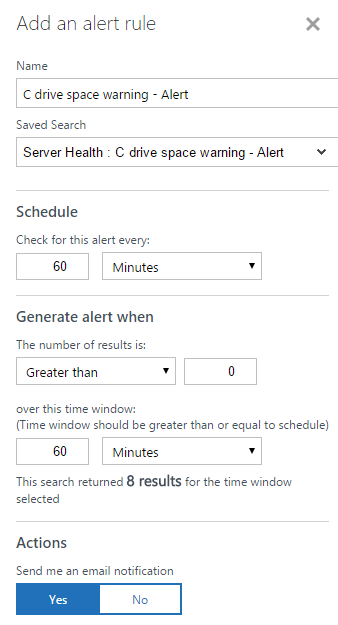 So why did I set the query to every hour instead of every 8 minutes? This period of time provides at least two data points which will exist after aggregation (one every 30 minutes). 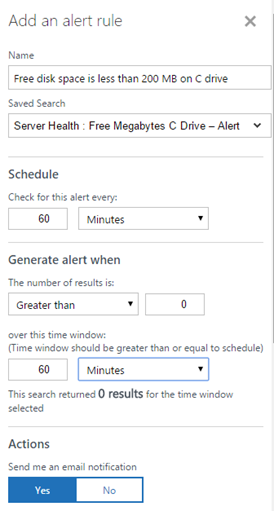 So in reality the approach in this blog will provide notification when memory is insufficient for a server over a one hour period and it will notify you every 15 minutes when these conditions apply. Important note #2: The queries which I have developed do not exactly match what we are working with in Operations Manager. 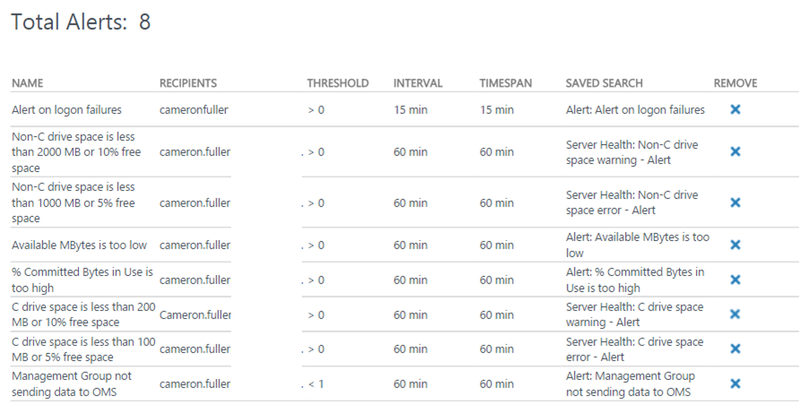 In Operations Manager the alert is created when both conditions occur (% free space and free megabytes). 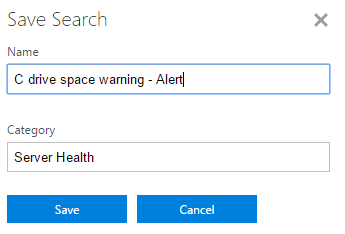 In my examples, the alert occurs if either of these conditions occur. Important note #3: This approach will alert on the condition every hour as long as the condition is continuing to occur (IE: If a drive is too low on disk space it will alert every hour indicating that it is still too low on disk space). 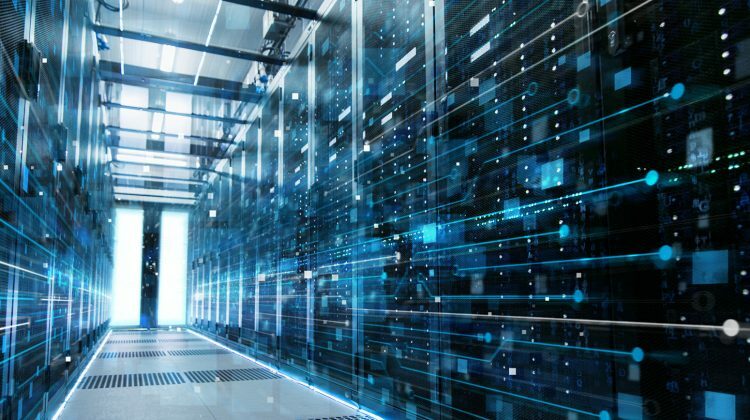 Summary: The approach explained in this blog post shows an example of how OMS can be used to provide similar functionality in terms of server monitoring to what we have been working with in Operations Manager from a memory utilization perspective. Once the queries can be updated to reflect data gathered on a smaller time increment this will be extremely similar to the functionality which we are used to within Operations Manager. Additionally, once there is a way to query for when both conditions occur (or if someone can show me how) that will match very closely to the functionality which we are familiar with in Operations Manager. 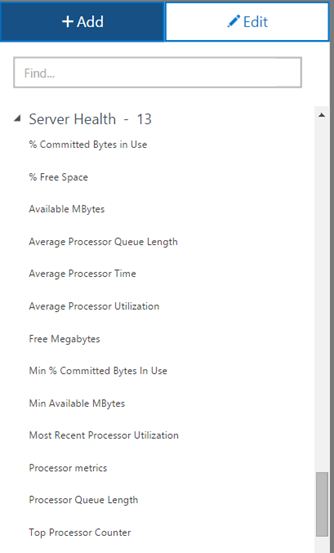 In the next part of this blog series I will be looking at server health from a processor perspective in OMS.